Crazing Technology for Polyester Fibers reviews PET fibers crazing in surface-active liquids and the use of the crazing mechanism for fiber modification by functional additives. The first chapter reviews existing literature, and subsequent chapters present the research of the authors, with an emphasis on how these techniques can be used to create textiles for a wide variety of purposes. 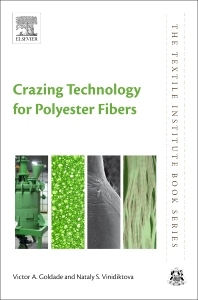 With two highly regarded and very experienced authors bringing together the latest information on polyester crazing technology, this book is essential reading for scientific researchers, engineers, and R&D professionals working on the development of fibers for improving the properties of textiles. Prof. Victor A. Goldade is a leading researcher at the V.A. Belyi Metal-Polymer Research Institute of the National Academy of Science of Belarus, Gomel, and a Professor at Francisk Skorina Gomel State University. He is a specialist in polymer physics and polymer composites technology, and has authored or co-authored more than 300 scientific publications (including 20 monographs) and obtained 210 patents. Dr. Nataly S. Vinidiktova is a leading researcher at the V.A. Belyi Metal-Polymer Research Institute of the National Academy of Science of Belarus, and a specialist in polymer materials science and polymer composites technology. She is an author on more than 40 scientific publications and has obtained 13 patents.